This tray for commercial baking applications was formed by WRH Industries in Fall River, Massachusetts. WRH selected a formable grade of Fortron PPS with impact modifiers and 15% glass reinforcement. Thermoformable PPS was selected for it’s ability to withstand the long term high temperatures of the baking process and still provide the impact resistance required for commercial operations. 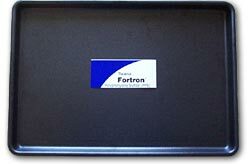 The tray, which measures approximately 20”x30”, was formed with 0.125” thick sheet.